​If you are someone who is in need of woodworking services, we at Walsh's Fine Woodworking can help. With over fourteen years of experience, there is no job too tough for our carpenters in Boston, MA to handle. Whether you need a new set of kitchen cabinets to be installed, crown molding on your ceiling, or paneling added to a pre-existing wall, we can easily get the job done with our expert skills. Not only do we offer the highest quality cabinetry and woodworking, but we can also work within your budget to make sure you get what you need at the right price. Please see services for a full listing of everything we offer. Although there are several cabinetry and woodworking services available in the general area, we stand alone not only in affordability but quality as well. 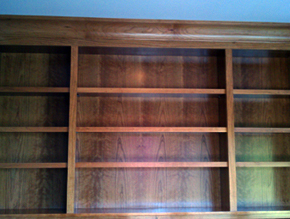 Our competitors simply cannot match our detailed woodworking and finishing. We are attentive to even the smallest details, we personalize our service to satisfy your needs, and we will do whatever it takes to get the job done right the first time. When we take on a job, our first priority is making sure the customer gets precisely what he or she wants. Our goal is to match your vision of what you want with what we actually build. We also understand our customers expect a job done within a certain time frame. The last thing any customer wants is for a job to be drawn out longer than it absolutely needs to take. With our know-how and professional expertise, we can make sure that not only is the job done within your budget but also within your specified time limits. Copyright 2012: Walsh's Fine Woodworking Inc. | Carpenters In Boston, MA | All rights reserved. 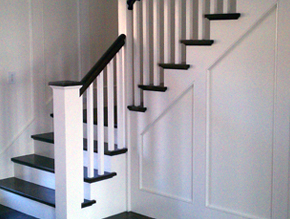 We can build an elegant looking staircase for you. Contact us for quality wall paneling or shelving.